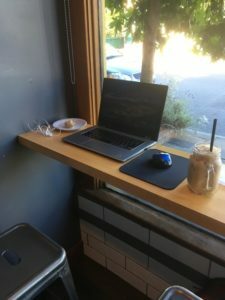 An ideal workspace: coffee shop window seat with strong wifi. At first, I felt I had limited time and money. It’s always hard to tell how many new clients you’ll be able to get or retain, so I gave myself a finite amount of time (10 months) and a budget. Luckily, my client list has continued to grow and I’m now looking to adapt my 2016 mode for 2017. Still, this year I traveled all over the United States, staying in any one location for two to sixteen days. My average was five days in a location. At first, I stayed in cities or national parks for an entire week or more. This was a little too slow and I slowly reduced the time. Eventually, if I visited a large city, I stayed for five days. A small city or national park warranted a 3-4 day stay. I also didn’t take long travel days. I didn’t want to be cooped up in the car, even though I enjoy the driving, for more than eight or nine hours. I averaged 470 miles each travel day or about six to seven hours. This pace allowed me to travel, arrive, settle in, unpack, and find the first coffee shop. I could then plan my excursions around my client workload, blocking off large chunks of time for clients interrupted by trips to museums, parks, more coffee shops, restaurants, and events. I wish I could travel in one of those converted vans, complete with solar power, back-up batteries, and wifi boosters. But I’m just moving along in my 2005 Toyota Corolla. I also carry my bicycle on the back so that when I arrive in a location, I can get around by foot or by bike rather than by car. Working from a movie theater lobby. I experienced the full range of lodging options in 2016, including camping, AirBnB, hostels, friends, housesitting, hotels, two nights in a yurt, and even a few nights in my car (when Big Bend National Park decided to flood the campgrounds to keep them green). Over time, I noticed two divergent trends. One, I got more and more comfortable in hostels, so I was able to spend less on lodging when I found a hostel in a city. On the other hand, I had to increase my AirBnB budget. Cheap AirBnBs can be worse than my old memories of cheap, dirty, noisy hostels, so I decided to spend a little more on AirBnBs to make sure I could get a quiet and clean night’s sleep. So, with hostels I got cheaper and with AirBnBs my budget grew. In planning my moves, I would look ahead one month at a time and book lodging that far out. The day-to-day details of living were what tired me out most in 2016. 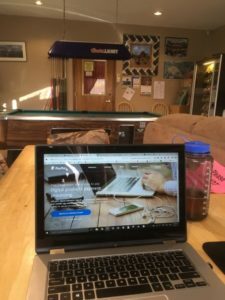 Every day a digital nomad must figure out where they’re going to work, eat, grocery shop, shower, use the restroom, get cell phone coverage, find wifi, charge laptops and cell phones, and work. Every week a digital nomad must figure out where to do laundry, how to stay in touch with friends, check the bank accounts and budget, pitch new clients or apply for projects, restock groceries, clean out the car, get ice for the cooler and dump water from the cooler, and gas up the tank. Every month a digital nomad must decide how to collect mail drops from home, book lodging at the next stops, look for events or places to see at the next stop, invoice clients, think about car repairs and maintenance, plan the general direction of the next leg of the trip, dry out the tent and make gear repairs, and plan for seasonal weather changes. In traveling while working, I realized how much of our life is built on routines – just knowing where you’re going to do laundry each week alleviates a significant amount of brain work that can be devoted to other things. Oddly, though, if it weren’t for the above-mentioned things, I might have been a little bored without the “to do” list. Still, I’m glad to be stationary for the next few months! The initial tech set-up was a mess. 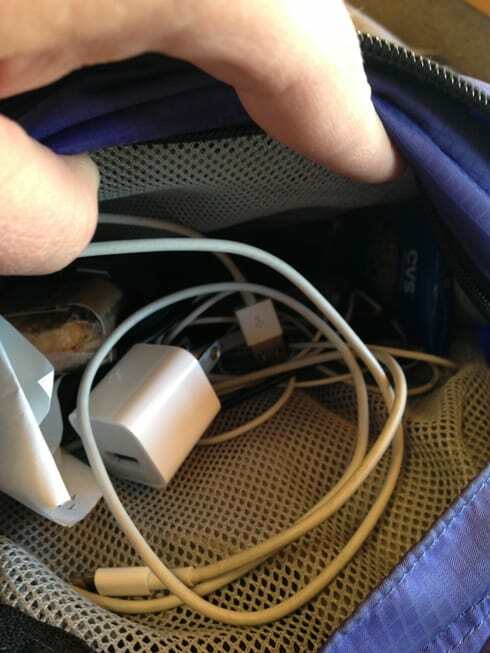 I eventually bought a laptop backpack with more compartments and organized the cords much better. I love reading about all the tech and gear digital nomads stock up on to work from the road. I kept it simple, though. I have a 2015 Dell laptop, an older laptop that serves as a backup, an iPhone that also serves as my wifi hotspot, three sets of earbuds, one of which I use for client calls because it’s much higher quality, a bunch of thumbdrives, lots of documents stored digitally, a Nikon camera, all the charging cords for the above-mentioned gear, and a mouse and notepad to make my laptop set-up a little more comfortable. At times, when I was in remote/rural places, I do wish I would have had a cell phone or wifi booster. There are still so many places across the US that don’t have adequate coverage. 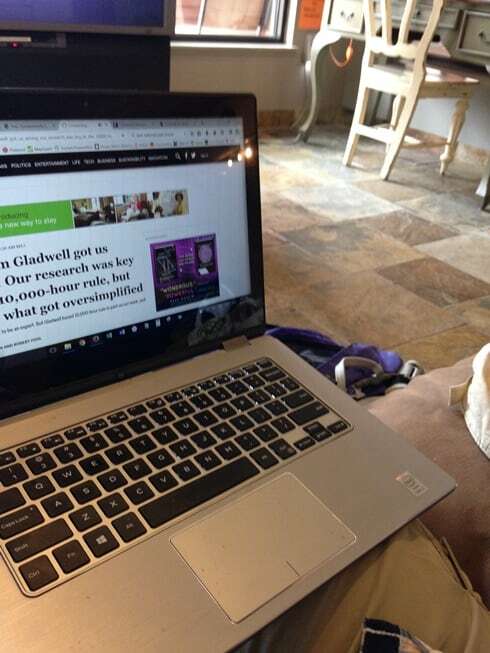 But I eventually settled into a routine of working at libraries with solid wifi and at coffee shops which, if they didn’t have solid or secure wifi, I at least had my own wifi hotspot. I prioritize my work with clients, even if I’m in a remote spot. So, there were a few times I took client calls in my car, since I could drive to a place with better cell coverage than where I was staying. There were also times I drove a considerable distance to get access to electricity and wifi in order to work. Our national parks aren’t exactly digital hotspots. But I never missed deadlines, calls, or project benchmarks. Invoicing clients from a campground game room. I’ve mentioned a few components of my working conditions above. Initially, I preferred working in coffee shops, but that adds caffeine, often food, and something of a time limit to any work session. Over time, I developed a calmer routine of work. I would eat a regular breakfast where I was staying and then head out to a coffee shop. I’d get 1-2 hours of work done there and then head to a library for 2-4 hours of solid client work. After that, I’d head out to lunch and a museum or sightseeing. 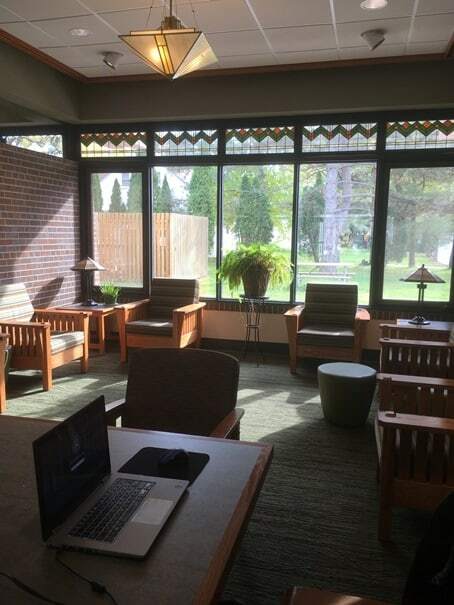 I’d often head back to the library, or return to my place of lodging if it was amenable, for 2-4 more hours of work. I often headed out for another coffee shop visit and any last project threads. The evenings were often left open for sightseeing or, since I’m a bit of a digital addict, more work or pitching. I was always clear with my clients that I traveled while I worked. These days, if you’re hiring someone to do online marketing for your company or non-profit, you can select from a national talent pool. Sure, you can work with local professionals and bring them in for meetings occasionally, but you can also find the perfect candidate for your project and keep in touch with them via e-mail, phone, and text. With one client, there was daily communication via all three channels. With another, we had occasional e-mails and then phone calls every few weeks. With another client, we had regularly scheduled phone call check-ins and lots of e-mails in between. And with another, we had some initial phone calls and then communicated largely by e-mail until the end of the project. I really enjoy the flexibility that this profession and lifestyle afford me. I can give my best energy to client projects without being locked into an arbitrary schedule. I also worked seven days a week and it did not once feel taxing. Plus, the travel and stimulation kept me engaged and excited about all other areas of my life. I saw and learned a lot that I could then pass on to clients or even incorporate into the projects we were working on. 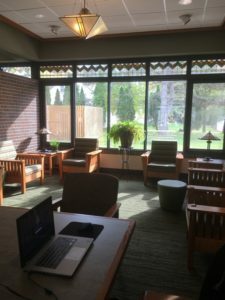 Libraries make for comfortable, productive, reliable workspaces for digital nomads. I scratched my Wanderlust itch in 2016. I’m planted in Kentucky for a few months now, but I would like to continue traveling in 2017. I would like to do it slower, staying in one location for 1-3 months at a time. This would allow me to stress less about the day-to-day living arrangements as well as explore an area more thoroughly and possibly even meet more people. This has been a great year, though. I got to do work I love with interesting clients in locations which excited me. I also learned a lot about myself in the process – I guess the exploration was internal as well as external. Are you a digital nomad? Do you have recommendations I should add to this list? Or are you thinking of working with a freelancer remotely? Do you have questions I can help you answer? Post your comments below and I’ll respond asap.